Wednesday, May 8 at 8:30 p.m.
Year after year for over a decade, the Israel-born, Texas-raised, Los Angeles-based, Avi Liberman has brought dozens of top American comedians to Israel to raise morale and money. 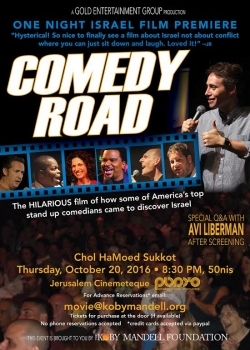 ‘Comedy Road,’ a new filmed account of these implausible tours, is both sidesplitting and moving. This documentary follows comedians as they perform in Israel while also following these comics as they made their way around Israel — showcasing their interaction and banter with Israelis, their developing understanding of our conflict and Israeli history, and their thoughts on divine power, on comedic power.